As the summer season brings its hot days to an end and autumn transitions into cooler, rainy days, you�ll need to step up your black skin care regimen to ensure that your skin stays healthy. Your skin, especially the kind that tends to dry out, suffers a beating when exposed to harsh weather conditions. Black skin that is dry should be kept hydrated because it is more sensitive to changes in temperature. You often hear that Black skin is no different from any other kind of skin. That�s not necessarily true. You've got melanin and the temperatures affect your skin differently. 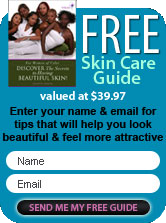 There are different skin types such as the oily, dry, and combination. Usually, it is the dry skin that is the one that suffers a lot during the colder season. The most common sign of damage during the chilly weather months is that the skin surrounding the nose and the mouth can begin to flake or chap. Red spots where your skin feels tight may also appear. The reason for these symptoms is that cold weather usually robs your skin of its moisture. As a result, your skin is left dry and more vulnerable to injuries. How to take care of black skin in colder temperatures should begin with a cleansing process of your skin. Remove the dead skin cells with a mild exfoliation. A gentle cleanser with beads or a soft washcloth may be used to scrub off the dead skin. After which, you can use an intense moisturizer to hydrate your skin to bring it back to life. Do not use the same body lotion or cream used during the summer months. The consistency and formulation can be quite different. Summer moisturizers are usually much lighter. Replace these products with richer formulas such as balms and creams. Also, do not forget how to take care of your beautiful black skin in all aspects during colder temperatures, meaning, take care of your lips by frequently using a lip product with moisturizers. Since prevention is easier than healing, it is important to know that moisturizing body lotions should be used daily after taking a shower or bath. Black skin benefits from using facial creams that have the ingredients of vitamin A, C and E during the cooler months. Finally, moisturize from the inside during the winter months. Avoid consuming drinks that can lead to dehydration such as coffee and carbonated drinks. Water is the liquid to drink to have healthy skin. Consume about a liter of water daily to keep your beautiful black skin healthy even when the weather transitions into cooler temperatures.